The child can not walk yet. Apparently, this is not a factor in the Christmas gift decision process. 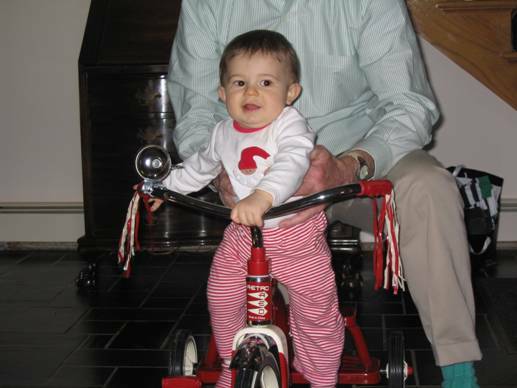 Grandfather and Nana gave Finn his first bike. As if he knew what to do, he grabbed right on to the handle bars and started to ring the bell. If he could reach the pedals, he might have rode away. 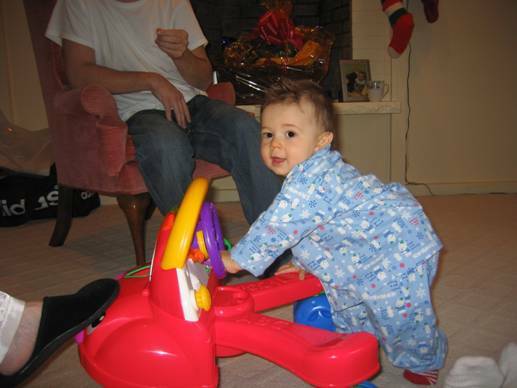 Not to be outdone, Nonno and Nonnie bestowed a car on the young master. He promptly turned on the “radio” and started cruisin’. 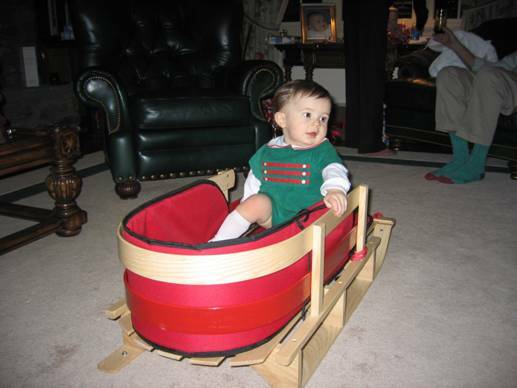 John & I did not get the “can’t walk yet memo” either and asked Santa to bring a sled for our little man. No bells and whistles. But stay tuned for the first big snowfall to see Finn whizzing down the hill at The Farm. On Christmas morning, it took Mr. Finn an hour and a half to open three presents and some stockings treats. 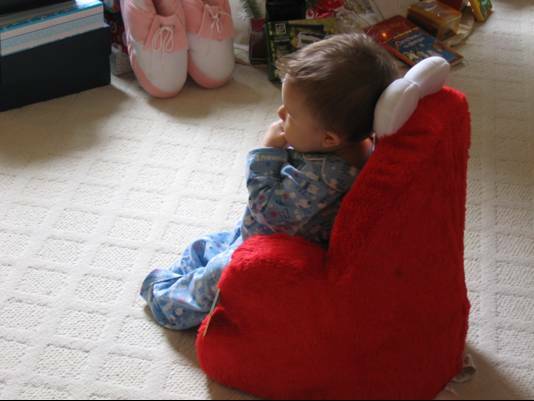 All the ripping and mugging for the camera wore the little guy out and he retreated to the comfort of his brand new Elmo chair to relax with a video. This is particualarly funny since John has recliner in our living room where he retreats to watch his sports in solitude. The chair is surrounded by a force-field called the NLZ (No Leah Zone). When he is in the NLZ, I can not try to sit on his lap or ask lots of questions. Like father, like son. Here is Finn in the NMZ (No Mommy Zone) where he is protected from the constant birage of kisses and silly made up songs. Finn was overwhelmed by his to-do-list this week. All that baking, last minute shopping, wrapping, visiting, a little more shopping, well, it just wore the little man out. Sorry for the bad camera angle. Nonnie and I wrestled him into his festive courdroy shortall and stuffed his sausage link legs in white knee sock casings. A pair of old school saddle shoes finished the look. The Santourage all piled into one car and set out for the Menlo Park Mall. The young master took a quick cat nap before his cameo with Santa. We were all giddy as we walked towards Santa’s spot in the mall. Nonno beemed as he carried Finn while Uncle Joe hoisted Finn’s man bag. Nonnie and I exchanged glances and giggles. It was quite a sight. There was no line. What luck! Making this sojourn on a Thursday afternoon was a smart move. After one last swipe of the hairbrush, I placed Finn on Santa’s lap. Finn was happy to see Santa too. All that prep and the whole thing took about 3 minutes prompting a “Now What?” from Uncle Joe. Apparently, he did not get the memo regarding high maintenance. Sorry for the delay in posting. We have been in Christmas prep mode. Instead of blogging, I was signing, stuffing, sticking stamps, and sending 125 Christmas cards. Yes. I am nuts. But I love, love, love receiving cards with pictures of my friends’ and relatives’ kids on them. John brings the mail in with him when he comes in from work. For the past few weeks, I shout from the kitchen, “Any Cards? “. I make a little stack and rip open each one with delight. John busts me that I wanted to have a baby just to send out a card with a kid on it. This is not true (ok, maybe it is a little bit true). 50 years from now at the home, I will be that little old lady that practically tackles the postman in her zeal to get her mail. I just love a good card. There is a new gated community in Metuchen. It was completed this weekend. Mommy served as the architect on the project establishing the design and sourcing materials. 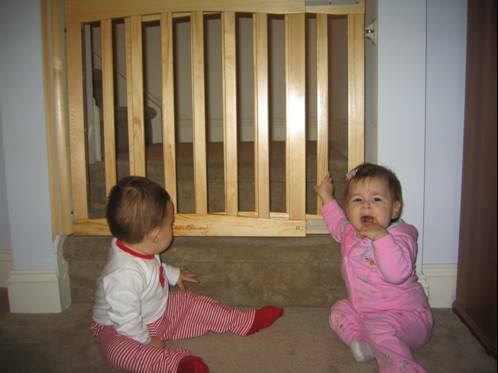 Daddy was the GC and honchoed the install of the shelving and gates. Initially Finn was not at all pleased with his new surrounds and burst into tears when the gate first clicked shut. Today he is coming around. He gave his friend, Anna, a guided tour of the community and seemed delighted to share the space. Apparently, a community of one was a little too exclusive. 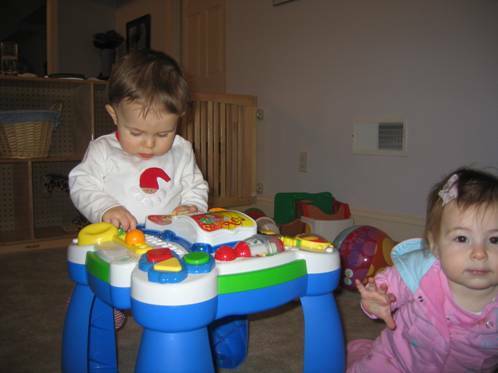 At the end of the playdate, Anna and Finn considered how they might make a break for it. The architect may need to revise the plans to incorporate a guard house at the main entrance. Like a big pizza pie, That’s Amore. Friday night is pizza night in the Kane household. Since we grew up in NEPA, home of Old Forge Style square trays, John and I know a thing or two about pizza that we are trying to pass along to Finn. Lesson 1 – The only place in the world they use the word “tray” to order is in Scranton. Everywhere else, it is a pie. Lesson 2 – Knives and forks are for sissies. Lesson 3 – When you move to a new place, try every pizza joint in town. Never settle. Mommy & Daddy selected La Rosa as the winner in Metuchen. It is owned by the police chief’s family and he is often slinging pies behind the counter. Best pie in town and the safest too. We call it The Chief’s. Watch Finn beg for some More Eh! As I rocked Finn to sleep last night and listened to the wind howl against the window, I thought of James Kim and the cold. The pictures of him cuddling his sweet-cheeked Sabine and spunky Penelope are windows into the life of a devoted husband and father. They are almost too much to bear. Like most people that followed the news story, I was devasted to hear the James did not survive his struggle to find help. As a new parent, I can identify with James and that feeling that wills a person out of the car and into the cold unknown. 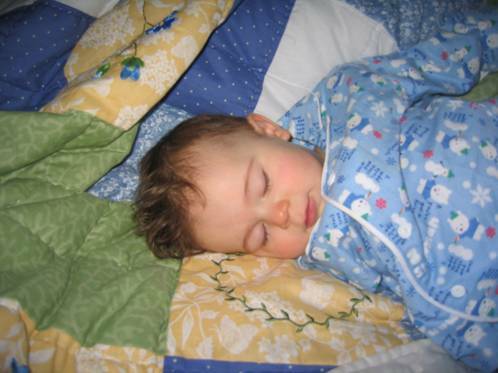 It is devotion with untold ferocity: James did what most parents would do to save their family. My only hope is that he knows his family is now safe. Rest in peace, dear man. Relax…No cause for alarm. 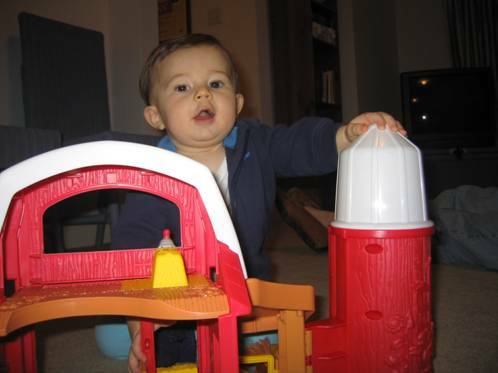 In the literal sense, Aunt Sandi bought Finn the Fisher-Price Farm. This Little People extravaganza features new “Touch & Feel” animals with a fuzzy-headed sheep and a horse sporting a mohawk mane. It is a big hit with Finn who as you well know has a penchant for all types of tresses. A) Old school toy. And you know how we Kane’s feel about Old School. Every kid should have the farm toy. B) Good practice. Not that we are going to have chickens and pigs at the home we build at “The Farm” in PA someday, but 6.2 acres translates into LOTS O’CHORES for the young lad. Getting up before dawn. Mowing lawn. Pruning Trees. Projects, son, projects. Unsuspecting Finn Ei-Ei-Os while Daddy relaxes in the background. Now, John loves his son, but the prospect of free child labor makes him giddy with delight. Mommy and Daddy have been digging a tunnel out of the basement for months using discarded plastic baby spoons. The truth be told; John planned a little get-a-way weekend for us. A special thanks to Nonnie and Uncle Joe for harboring an tiny teether while we napped and dined in tranquil silence. We owe you – Big Time. We raced home to pick up the little boy and I could not stop kissing him and squeezing his dupey. We missed his little face, but knew he was in good hands (see Mom I told you I would not write anything incriminating) . It was so sweet to tuck him into his own crib tonight. Nigh Nigh, little man. Mommy and Daddy are home. 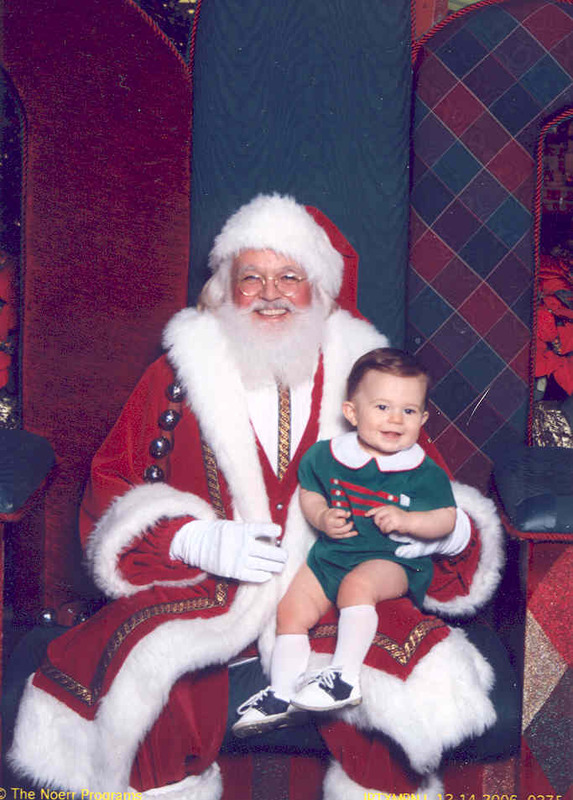 You are currently browsing the Raising A Little Kane blog archives for December, 2006.